While consumer technology advances by leaps and bounds, the devices patients use to manage diseases often seem stuck in the past. A glaring example is the glucometer, the instrument diabetics use to measure the sugar in their blood—information they use to adjust their diet, exercise and medication. These meters, which analyze drops of blood drawn from fingertips, typically resemble crude PDAs from 10 or 15 years ago. They offer little feedback and can’t connect to the Internet to show results to caregivers. Most diabetics who use them log their readings on paper, which they hand doctors weeks or months later. But that is beginning to change. Next week, a small start-up will introduce a new diabetes meter it says is the first with wireless technology that instantly transmits a patient’s readings to a private online database, which can be accessed by the patient or—with permission—by a doctor, caregiver or family member. This system charts the results to highlight trends and spot problems, and can be accessed via a Web browser or an iPhone app. It automatically transmits relevant feedback—such as whether your readings seem high or low—and allows doctors to respond. Telcare can indicate if a reading was taken before a meal. I’ve been testing this new meter and service, which is called Telcare and comes from a Bethesda, Md., company of the same name. As a Type 2 diabetic myself, I found the Telcare meter a refreshing change, and a significant step toward bringing consumer medical devices closer to the world of modern technology. Despite some drawbacks, including a high price, I recommend the Telcare be considered by diabetics who want a better substitute for paper logs, or would benefit from real-time sharing of their readings. However, as with any medical decision, I urge people to consult their doctors before switching meters. Also, I evaluated this product as a consumer technology. I am not a physician or diabetes expert. While I found the Telcare meter convenient and accurate for me, your situation might differ. An iPhone app can turn results into detailed charts. The Telcare device works much like a traditional meter. You insert a test strip into a slot on the meter, then prick your finger with a lancing device to get a drop of blood, touch the strip to the drop, and wait for the reading to appear. The difference is the meter immediately sends results to its online database, where you or your doctor can find it via the password-protected Web site or iPhone app. This transmission is achieved via a built-in cellular modem, which doesn’t involve any cellphone, carrier contract or fee. That cellular connection is used to send you messages about your readings, if necessary. In this first version, the patient can’t reply to doctors’ messages from the meter, but that’s planned for the future. Telcare typically uses T-Mobile’s network, but, if that’s not available, the meter will automatically shift to whatever compatible connection it finds. If no connection is available, it will save the results and you can transmit them manually when you’re back in range. 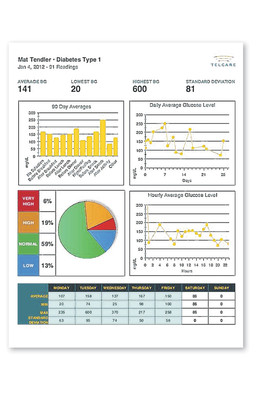 Because it automatically logs results and allows real-time sharing, I believe diabetics who use this new system will be less likely to skip readings, or to fudge the numbers, especially if they allow doctors and other caregivers to see the results instantly. And that could mean an improvement in their health. While it’s a leap ahead of typical diabetes meters, the Telcare meter isn’t exactly cutting edge. It looks like a thick, old cellphone, though it’s light. Unlike most other glucose meters, it has a large color screen that allows it to display informative graphics and messages. One drawback is the price. While many diabetes meters cost well under $50, or are free (the money is in the test strips), the Telcare meter costs $150 for a starter kit that includes the meter, a wall charger, a case and accessories. The cost drops to $100 if you subscribe to a one-year supply of test strips. The strips cost $56 for a container of 50, or $36 with the subscription. Insurance may reduce these costs. Another drawback is battery life. Traditional meters use removable batteries that can last months. The Telcare has a sealed battery and must be recharged frequently, like a cellphone. The company says if you turn it off between readings, a battery charge should last for 200 to 300 tests. If you leave it on, it will go to sleep between tests and need to be recharged every two or three days. In my tests, doing three readings a day for four days, I didn’t need to recharge it, but I turned it off when not in use. Also, many diabetics carry around their meters, and the Telcare is larger than any traditional meter I’ve seen, though it fits in a pocket or small purse. Finally, the meter and strips will, at first, be available only from the company, though it’s hoping to sell them in drugstores soon. In my tests, the meter was easy to use and gave me helpful messages, such as whether I was in my prescribed range, or what my daily averages were. A Telcare official posing as my doctor sent me test messages reacting to my readings. I can’t judge the accuracy of the Telcare, but it has been cleared by the Food and Drug Administration, and the company says it meets or exceeds FDA standards for accuracy. Its readings seemed right to me. I found the Web site and iPhone app worked well, giving me constantly updated and detailed lists, graphs and pie charts that showed me where I stood over short and long periods. These can be printed out or turned into documents for email. You can also enter notes for any reading and the meter asks you to indicate whether a reading was, say, after or before a meal or physical activity. Using the Web site, you can adjust your preferred range of glucose readings to fit your doctor’s advice. And the iPhone app allows manual entries, if you use another meter. I did find some bugs, all of which the company pledges will be fixed before next week’s launch. In one case, when a reading produced a clearly erroneous number (something that can happen with every meter I’ve used) the Telcare failed to offer advice on what to do. Two subsequent readings were correct, however, and the company says such errors are rare. In another case, I found I could alter a reading on the iPhone after transmission. Telcare isn’t the only company trying to drag the glucose meter into the modern era. Entra Health Systems has a meter called MyGlucoHealth that transmits readings via Bluetooth to a cellphone for transmission to an online portal. And Sanofi and AgaMatrix offer a diabetic-testing attachment for the iPhone called the iBGStar, which isn’t yet available in the U.S., but is sold in some other countries. It can email results. 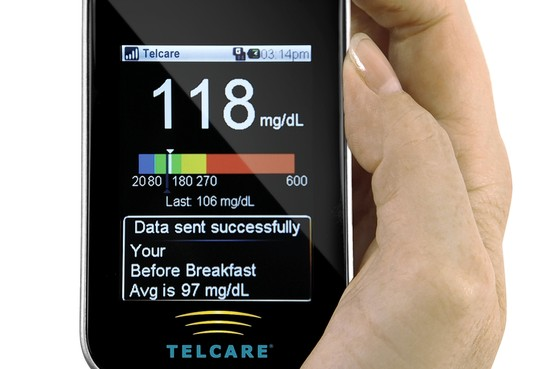 But the Telcare device is a leap ahead of nearly all glucose meters. If you’re a diabetic, or care for one, it’s worth a look.